Do you think it would work to do these in the oven at 170 degrees (as low as my oven goes)?? Always on the search for a another good cracker, just a family of SCD junk food junkies I guess. This sounds great! Yes, I do think this would work well in an oven. If you try it and it works, would you be willing to post the temperature and time that worked? I'll try it too. Did you use a raw red bell pepper with the skin? I did. The instructions from the show weren't clear, but since it's a raw food thing, I assumed that's what they meant. I think it might work better if the pepper were roasted and skinned. So I made a version of this today - changed it up a bit. I used cashews (had them at home) that I had soaked overnight - doubled the recipe, and I added a scallion, three cloves of garlic and parsley to the cuisinart. Broiled the red peppers briefly to remove the skins. Then I cooked it in a convention oven for several hours at 225. Thanks for the recipe! Man, that was good- though I'm getting a bit more of a wheat thins vibe from it then cheez- it. But I can already tell I am making this again! I'm going to try it with cashews too. Those macadamia nuts are expensive! Would this work without nuts or are the nuts needed to act like "flour"? 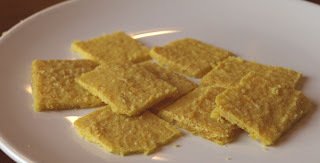 My daughter is anaphylactic to all tree nuts and peanuts, but she would love it if I could make her some crackers like this. Thanks. After I posted, I thought "maybe coconut". We just started the SC diet, so I'm still feeling my way around. I'll give it a try once we progress a bit further with adding foods, and will report back what happens!